I know, I know... a desk in a master bedroom is a "no-no" but I have no office space in my home and currently, no other designated work space. My bedroom is in the back of the house which makes it nice and quiet AND has a bunch of big windows in it so I get a nice breeze while I work! For me to be inspired and to stay on task, my work space needs to be clean, functional and have nice things to look at. The task lighting is no exception. -REALLY, THAT IS THE SECRET TO LIVING HAPPY! Surround yourself with beautiful things AND people that you love and admire. Life's too short, peeps! 4. They HAD TO HAVE a SHADE! Having a bare bulb shining in your face is never comfortable. So here we go! 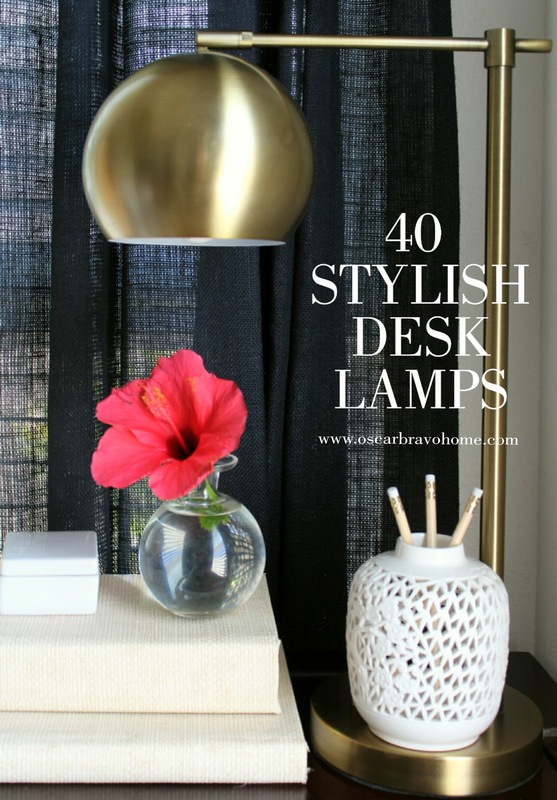 Here are my top 40 pics for desk lamps! All the lamp pics are linked so if you're interested in one, click on the pic and it will take you to the site to purchase! BAM! That easy!